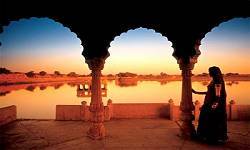 Rajasthan Tour Packages : Rajasthan is a land where the relics of golden past have been carefully preserved for the benefits of the tourist. As a tourist destination, this state renders countless moments of pleasure for the tourist. The traditional warmth and hospitality is renowned worldwide !! The culture dominating over this land of silvery sand dunes is awe-inspiring. Come and .. Enjoy the unforgettable Rajasthan tour that lets you relax, hunt, shop or simply tour this beautiful state. Your vacation can be as relaxing or adventurous as you want it to be! Early morning Drive to Jaipur (by road approx 4 Hrs), reach Jaipur and visit Amber Fort. Afternoon visit City Palace, Hawa Mahal and Jantar Mantar. Evening drive to Delhi & reach Delhi late evening. Rs 7000 for 1-3 persons. Rs 9000 for 4-5 persons. Early morning Drive to Agra (by road approx 4 Hrs), reach Agra in the afternoon, Afternoon tour of Taj Mahal, Agra Fort and Sikandra. Overnight at Agra hotel. After breakfast drive for Jaipur enroute visit Fatehpur Sikri. Jaipur late Afternoon. Visit of Hawa Mahal and colourful Jaipur Bazar. Overnight at Jaipur hotel. After breakfast visit Amber Fort with Elephant ride. Afternoon Visit of City Palace, Jantar Mantar and Museum. Overnight at Jaipur hotel. After breakfast drive for Pushkar. Afternoon visit of Pushkar Lake and Ghats, Brahma Temple and Pushkar Handicrafts bazar. Overnight at Pushkar hotel. After breakfast drive for Ajmer. Visit Dargah of famous Sufi saint Khwaja Moin-ud-din-Chisti. Afternoon drive to Delhi & reach Delhi late evening.